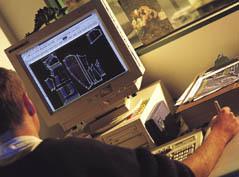 All Tiger Angel products are produced using Computer Aided Design and Manufacturing. The company operates under the ISO9001 Quality Assurance system - certified by Benchmark Australia. Only by using CAD CAM and ISO9001 documented processes can Tiger Angel bring you reliable high quality products and flexible custom made at a reasonable price. Tiger Angel motorcycle clothing is cut to give you maximum freedom of movement and comfort. Every aspect has been carefully designed to keep you happily concentrating on the business at hand, namely riding your motorbike. Try on a set of Tiger Angel leathers and see the difference that years of traditional experience combined with computer aided design can make.